Dominique Doseck had scored plenty. But near the end of the game, Ohio needed a few more points to put Toledo away. With 3:38 left in the game Sunday, the Bobcats were up by 10 against the Rockets after having held a 17-point lead heading into the fourth. But shortly after the Rockets cut the lead, Doseck hit a 3-pointer. 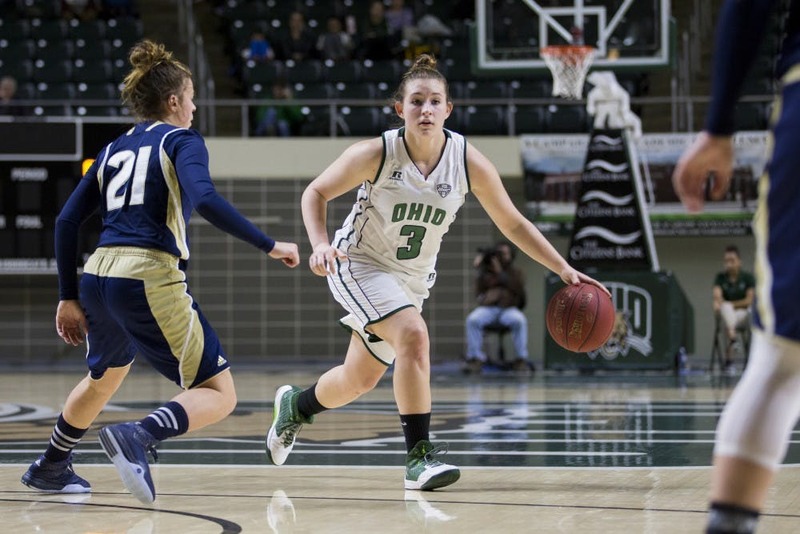 Doseck’s 3-pointer helped the Bobcats maintain their lead, and she scored a career-high 27 points as the Bobcats defeated the Rockets 78-61 in The Convo. The Bobcats ended 2017 on a two-game win streak, and they opened Mid-American Conference play with a win. But Doseck, one of Ohio’s best scorers, needed a game like this one. In the previous six games, Doseck averaged 7.6 points per game; she averaged 9.9 points per game before Sunday. Also, in the previous six games she averaged 22.0 percent shooting from the field and 18.3 percent from three. Doseck struggled to shoot well recently, but she hasn’t wallowed in her troubles. At the beginning of the season, Doseck was one of the Bobcats’ premier scorers. And as the No. 3 scorer behind Amani Burke and Cierra Hooks, she still is — she averages 11.3 points a game. When Doseck shoots well, both she and the Bobcats benefit. Still, Boldon’s offense isn’t set up to run through any particular player. But Doseck’s ability to shoot well allows her to succeed in an offense that doesn’t necessarily have a No. 1 or 2 option. While Doseck had her best game of the season, Ohio had its best of the season since it beat Purdue. The Rockets are part of a talented MAC West division that also features Central Michigan and Ball State. The Rockets are also the reigning MAC champions, so for the Bobcats to get a win against them is important. The Bobcats are ranked No. 10 overall in the MAC, but with conference play underway, continuing to win and improve will be the goal. If the MAC remains competitive, every game will be significant for the standings. Before Sunday, Doseck was in a slump. Throughout the season, the Bobcats (7-5, 1-0 MAC) have struggled to shoot well. But their numbers have begun to improve. In its games against Toledo and North Carolina A&T, Ohio has averaged 38.5 percent from the field and 31.3 percent from three. Still, Boldon said he doesn’t want this game to be the only good one Doseck has this season. And the same can be said for the Bobcats. Up next, Ohio (7-5, 1-0 MAC) will play on the road Wednesday against Central Michigan (9-3, 1-0 MAC).